In the veterinary profession and elsewhere people are raising awareness of the issues brachycephalic animals face as a result of their breeding. Brachycephaly refers to a short skull shape, which gives the appearance of a flattened face. It can affect dogs, cats and rabbits. In the past ten years there has been a rapid rise in the number of canine brachycephalic breeds in the UK such as Boxers, French Bulldogs, Pugs etc They look cute and have great personalities! These breeds are normally happy and bouncy and cope with their problems well so often we don’t think anything is wrong, but we can make life much better for them, both by selective breeding and by treatment. Respiratory sounds by these dogs, such as snorting and snoring, are not normal, but instead are clinical signs of compromised breathing. For people getting a new puppy it is important that they come from parents who have good shape and they understand the potential health problems of brachycephalic conformation, talk to us for advice. As most of the problems produced by BOAS come from upper airway obstruction, the main aim of treatment is unblocking and widening the airways. This is usually achieved by surgically widening the nostrils and shortening the soft palate at the back of the mouth. In most instances, dogs having undergone surgery will be sufficiently improved for the rest of their lives but a few will deteriorate again with time. We are very lucky that our surgery certificate holder, Suanne, can perform these procedures. If you own a brachycephalic dog she can do a BOAS assessment for you to see if surgery would help. We can also advise on conformation if you are thinking of breeding from your dog or getting one of these breeds as a puppy. Cats with short noses can have breathing issues too as well as runny eyes that stain the face. Surgery isn’t usually used for these cases but we can often improve things with medicines and other treatments. 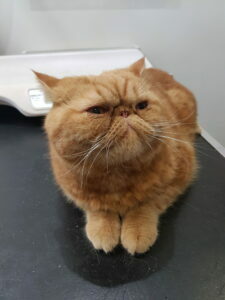 A very handsome brachycephalic cat. Rabbits have been bred with shorter noses, again for their looks. This can lead to problems with the teeth not being aligned properly. A rabbits teeth grow throughout its life and as a result , if the teeth don’t meet properly to grind themselves down, they can overgrow which can result in painful spurs on the teeth or incisors that just keep growing until they interfere with eating. 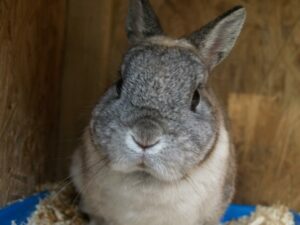 We treat these rabbits by dental procedures, either trimming the teeth or spurs, or removing the teeth.